Hacked Gadgets :: View topic - Wireless Xbox 360 controller LED project HELP! Wireless Xbox 360 controller LED project HELP! Posted: Fri Dec 08, 2006 1:57 pm Post subject: Wireless Xbox 360 controller LED project HELP! 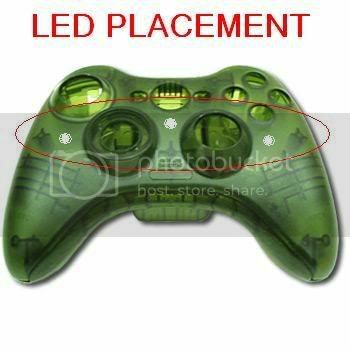 Here's the idea: I want to put 3-to-6 5MM super bright green LEDs in my wireless xbox 360 controller. I will custom build the mounts for the leds using stock LED mounting pieces and controller supports. 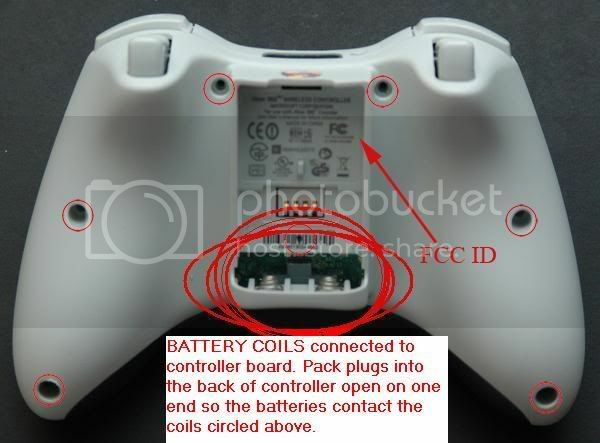 Here's the problem:The battery pack for the controller consists of two 1.5V AA batteries = 3.0V output. The play and charge kit battery only supplies 2.4V. The LEDs need to be bright because they are under a dark green see-thru case I purchased through decalgirl.com. Most of the LEDs I'm finding online require 3.3V-to-3.5V. Now I've figured out some options as to how I can approach this. 1) I found a small pack that allows you to step up a 3V current to 9V. My concerns with this method is how I could wire off of the battery pack to the "step up box" without that effecting the voltage going to the controller. Battery life is also a consideration. 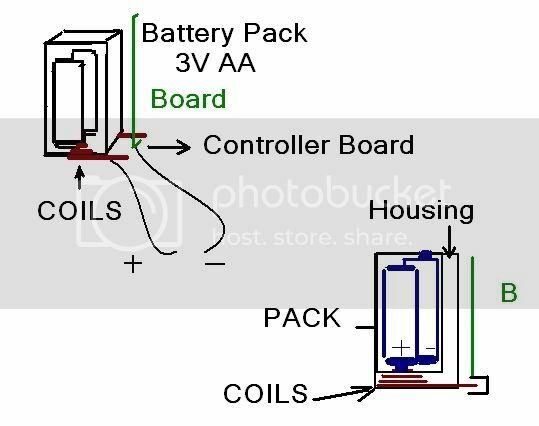 2) Coin batteries could be used and they supply a 3V current. Two coin batteries would fit inside the controller case as well. Then the circuit would be seperate from the controller, not as much fun lol. Battery life is also an issue here as they would only power an led circuit for up to 12 hours. 3) Adding more AA batteries. I think this would be interesting as I could custom make a battery case/fixture from the backs of two controllers. The battery life would be far greater with AA's than with coin batteries. 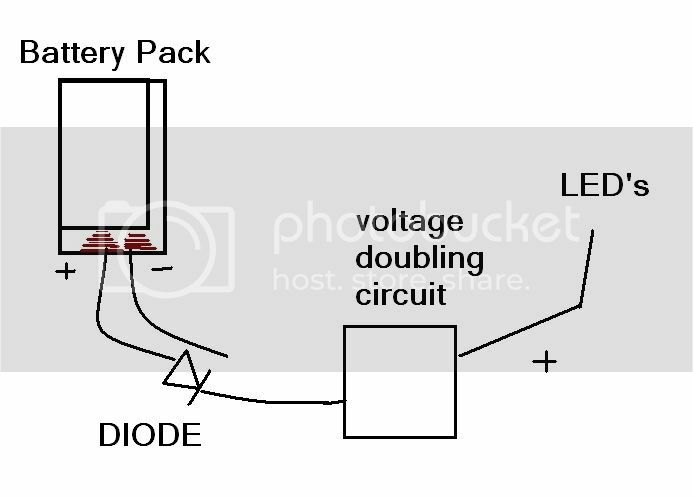 My problem here is that I dont know if it's possible to mount all 4 batteries together (6V), and then have seperate circuits for the controller at 3V and the LEDs at 6V. How could i do this ? What I need is advice on the most efficient method of powering the led's and minimizing the weight and size of added batteries. I'm not sure what to do with a 3V source, since the leds I need to get are 3.3 or 3.5 volts. Any input would be greatly appretiated as this is my first LED project. There are some custom mods done by Llama.com that you can check out on thier 360 page. The picture at the front of my post is from Llama of a wired controller, no problem there, constant 5v source. How do I power the LEDs from the 3V source in the wireless controller HELP! That should bring you up into the range for powering the LED's. You are going to experience shorter than normal battery life, but that is just the nature of the beast. The arrow with the bar in front of it is called a diode, and the bars with the positive and negative are capacitors. Diodes limit the direction that electricity can flow....LED's are Light Emitting Diodes, and do the same thing a regular diode does, with the exception that you can see the output in light. The thing on the left behind the + sign is a transformer. 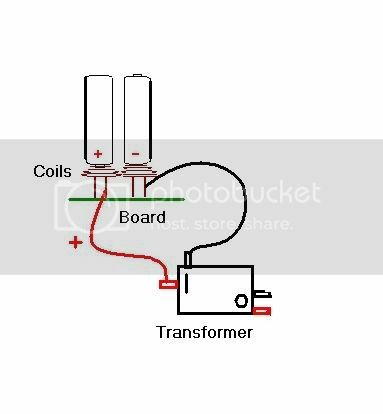 This isnt an AC circuit, you are dealing with, so try to visualize a + sign, and then on the other side, a ground, instead of the transformer. 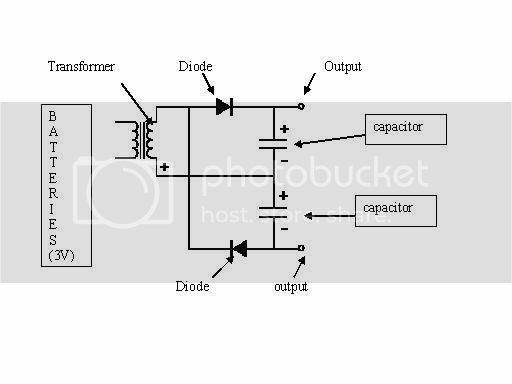 What you are doing in this instance is doubling the voltage by storing the charge in between the capacitors, and having it added to the fundamental voltage, which doubles it. Then, since the diodes regulate which way the electricity can flow, the doubled product goes out to your outputs. Microchip has a Pump-Charge transformer http://www.microchip.com/stellent/idcplg?IdcService=SS_GET_PAGE&nodeId=1335&dDocName=en025847. It takes 1.8v-3.6v and outputs 3.3v, which should be enough, even for the 3.6v LEDs. It outputs 100mA so you should be able to power 5 or so LEDs in parallel. Please progress this diagram further - if possible - as it fits to my particular application. Ok, now, the batteries will be mounted into the controller and wired to the battery pack. To branch a voltage doubling circuit off of the batteries i would have to wire to the positive and negative caps that are built into the power housing on the controller or to the batteries. Would having this second circuit branching off the battery pack affect the voltage being supplied to the controller board ? Also I have no understanding of capacitors or transformers, so I will be researching them to gain a better understanding tonight. Let me know if I have the schematic right as I have added to it. Any additional information you may have on transformers and capcitors that fits this application would be appretiated (ie what types of capacitors and what type of transformer to use). I really appretiate your input and consideration. OK I'm beginning to understand what you are saying. So if I use a diode right off the battery pack and then go into the transformer and capacitor doubling circuit the diod will control the flow of the current, blocking it from the controller board. What do I do with the negative lead? What would really help is a "schematic for dummies" like from the batteries to the leds. Thanks for your help guys. Here is a basic layout of what I understand so far. I would appretiate if you could add to this to show me how to set up the circuit including the wiring of capacitors and diodes. I could also use a link to the proper diodes and capacitors to use here with the transformer Bronze G3 posted as I know little about them except for what they do. Do I even need the capacitors and diodes or could i just go off the controller pack to the transformer and then to the LEDs? Posted: Sat Dec 09, 2006 4:48 pm Post subject: Re: Wireless Xbox 360 controller LED project HELP! Have you tried to install the Green LEDs and power it using only 3v? I use Green LEDs from 5,000 mcd and up. I always power them at only 3v from CR2032 batteries. The brightness level is intense event at 3v. More Volts will make it brighter, but have you tried 3v yet because 3v just might end up being TOO bright causing you to want to reduce LED power. I've only found a few LEDs that say they can be run on 3V. The majority want 3.5 to 3.7V typical voltage to run. If you could supply a link to the LED's you are talking about I will purchase them and try them out as this method would be easy to test. Thanks for your input I would appretiate a link to the site where you purchase the LEDs. I'm going to try to wire some leds right off the battery pack. I found some LEDs through Luxeon that have a voltage drop of 3V. They are ultra white. I will place two at each of the three locations I noted in my previous post. I'll order the LED's tomorrow morning. I will be making more posts as I make progress with the project. Once I have this working I'll post a detailed tutorial on the site with info on how I did the installation and pictures of the controller. I will be giving credit to everyone who has offered advice in this forum in future posts here and elsewhere. If I can develop a system that runs the Led's brightly without totally killing the batteries I may pattent a structural design in the future. The pattent will include the custom mounts and the circuit design related to an xbox 360 wireless controller. Does anyone know a good site to buy some wire from for the circuit? I usually get my wire from http://www.elexp.com/cbl_24bk.htm, but they require a $20 minimum order before shipping. If you only need a small bit of wire, I would say find an ethernet cable you aren't using, cut it up, and use the wire from that. If you really need wire and those two methods don't work, radioshack has a decent assortment of wire, but extremely overpriced. Thanks a lot Bronze, I ordered the LEDs this morning and I'll get the wire out of my old 100 foot ethernet as I just replaced it with a shorter 50 foot. I appretiate all your help, I will be posting pictures of the finished results and instalation in the next few weeks.